I am addicted to Target. There. I said it. Man, that feels good to get off my chest! There is something about strolling up and down the aisles, pushing a red cart and sipping a Starbucks mocha, that I find relaxing. Every once in a while I come across something for my Spanish classroom and think, "Aha!". Here are five of my favorites finds. 1. Story Cubes Nine cubes, 54 images, over 10 million combinations. Can you say POSSIBILITIES? 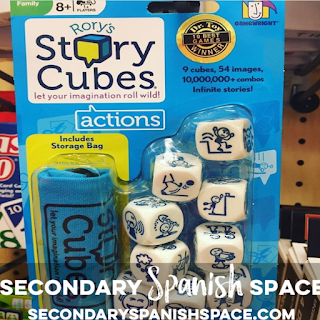 These cubes are so much fun for a speaking, listening, or writing activity. Pre-teach the verbs and go! You can break students into small groups and give them a set of cubes and have them work together to create a story in whatever tense you are studying, use them in pairs where students can create sentences either orally or on paper based on what they roll, or have students work individually to write sentences. Instagrammer @colorele.es uses them while studying the future tense to get her students talking about their future plans (www.colorele.es). 2. 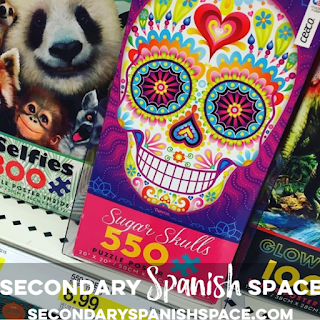 Sugar Skull Puzzle Looking for a fast-finisher activity that doubles as a classroom community-builder? Set up a puzzle! I like to keep one going at all times and this sugar skull puzzle is perfect for a Spanish classroom. Students know they can go work on it if they finish an assignment early. I love seeing kids who might not normally sit together at lunch or an assembly laughing and working together to find a difficult piece. The camaraderie carries over to class activities. 3. Jenga The game Jenga can be used for more than just causing heart attacks when the wooden blocks come crashing down. I love customizing the wooden blocks for my Spanish class by writing questions in Spanish on them. 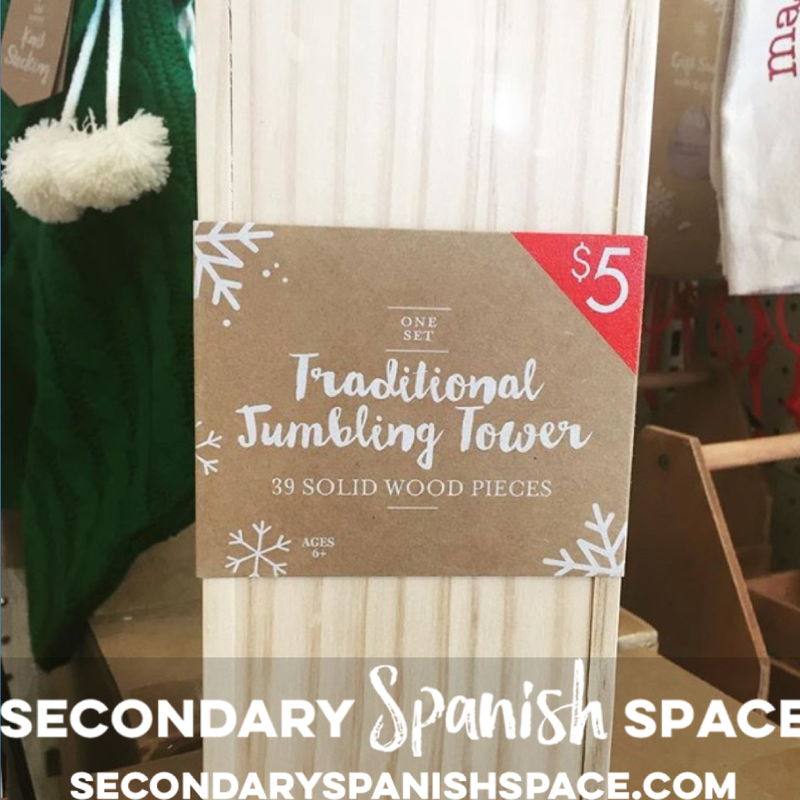 When a student pulls out a block, he/she has to answer the question on the block in Spanish before it is the next person's turn. So much more fun and engaging than putting the questions on a slip of paper! 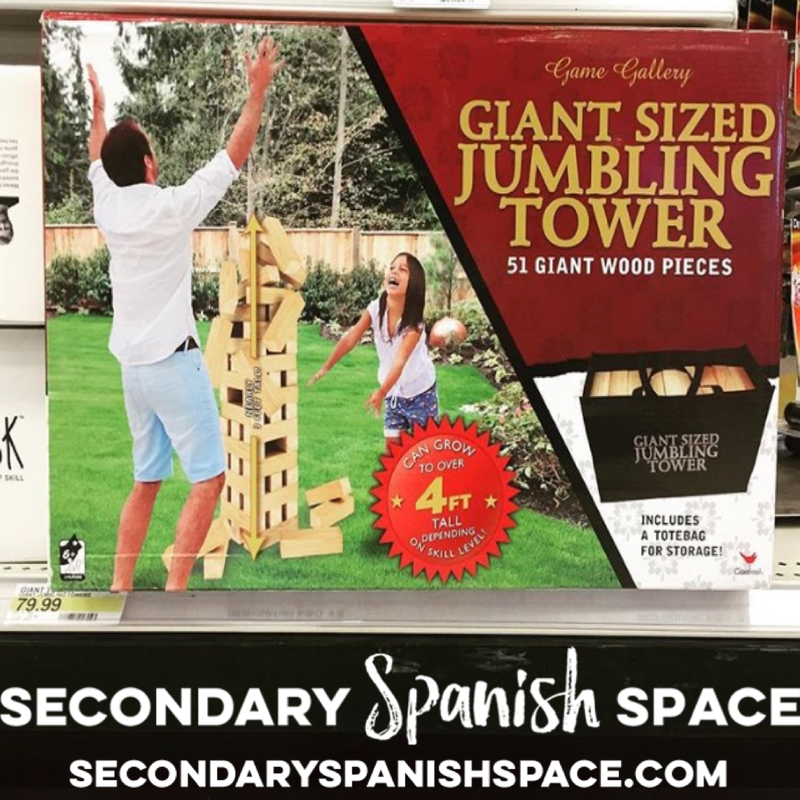 Target offers a couple Jenga options. 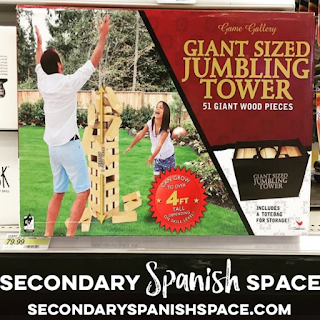 My favorite is Giant Jenga. Yes, it is pricey when not on sale, but I swear it is on sale every other time I go to Target (which if often 😁). There is also this sweet set for $5 during the holidays in the Dollar Spot if you want a more affordable option. 4. Whiteboards Mini whiteboards get A LOT of use in my classroom. Imagine how excited I was to find mini whiteboards WITH PENS in the Dollar Spot during back to school season for a buck a piece. A dollar! I love how one side has lines because, let's be honest, there are many high schoolers with awful hand-writing. The lines help. A bit. 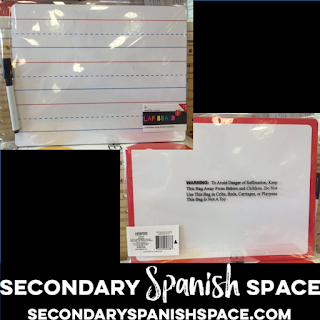 :) Mini whiteboards are great for formative assessments or a station during test review. I love using them to review vocabulary before a quiz or test. 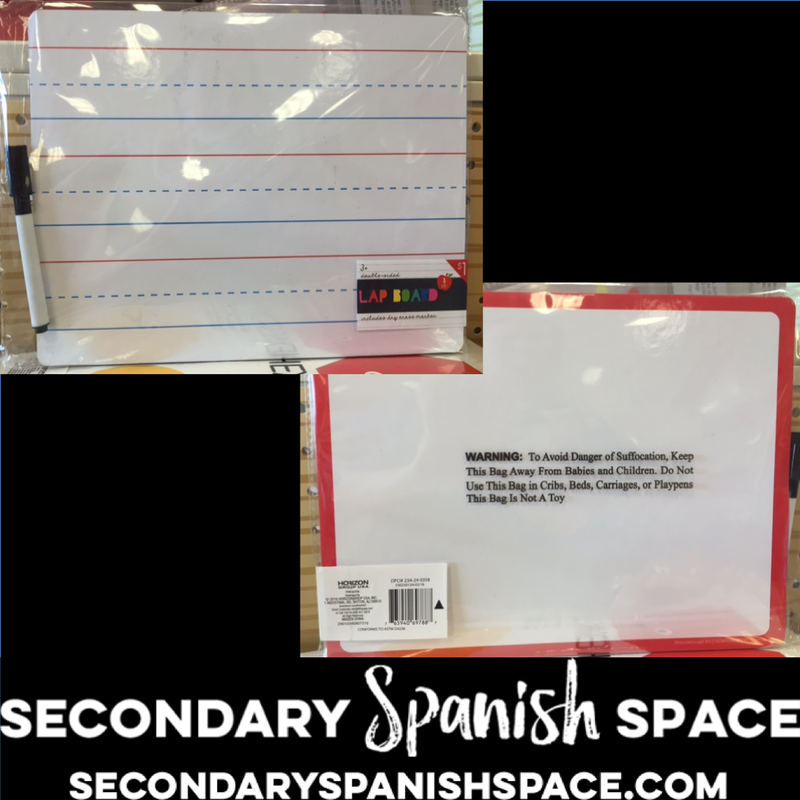 I run through the words in Spanish first and they have to write the English equivalent on their whiteboard to check for understanding. Then I say the words in English and they have to write them in Spanish. That's the harder one so I always do that second. I also like to bring them out when learning a new verb tense or irregular verb. I ask students for a subject and a verb and then they have to create a sentence using those two pieces of information. They get really creative! With both vocabulary review and sentences I can easily assess their understanding and give them immediate feedback. Students have to hold up their whiteboards when done writing for me to check. Only once they've received a thumbs-up, perfecto, excelente, or something similar may they put their boards down, erase what is on them, and get ready for the next one. If a student has a mistake, I tell them spelling, accent, structure, adjective agreement, etc. so they know what is wrong. They need to fix it before the class can move on. Kids are really patient and helpful when others are fixing things. It is really neat to see! 5. 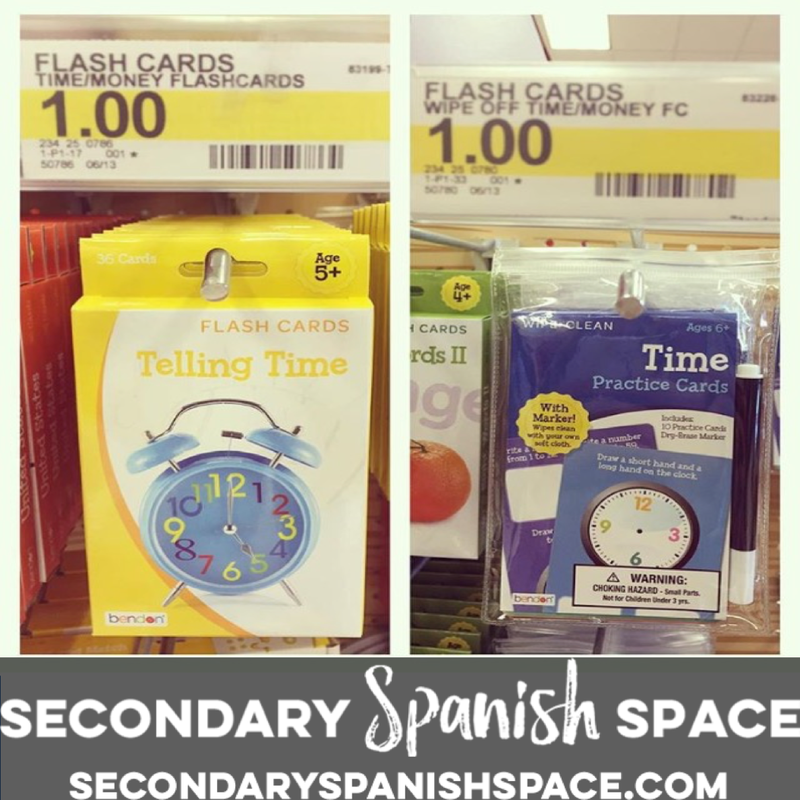 Time Practice Cards Telling time in Spanish is tricky so I like to give my Spanish 1 students lots of different practice activities when we are learning it. 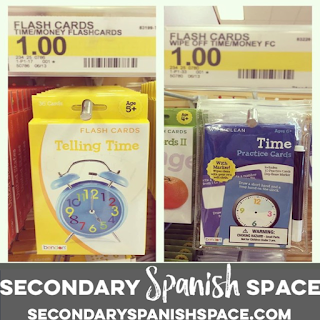 I was so excited to find these telling time flash cards and wipe-off practice cards in the Dollar Spot for A DOLLAR a set (10) at the beginning of the school year. The flashcards are perfect for students to use in pairs to quiz each other or for you to use like a task card around the room or in a game. I love the wipe-off practice cards for an individual activity as a formative assessment. I call out times in Spanish and students draw the corresponding time on the clock face and hold it up. Easy for me to quickly check their understanding and adjust my lesson plans. They pair really well with my Telling Time Task Cards or Telling Time Jeopardy-Style Trivia Game. 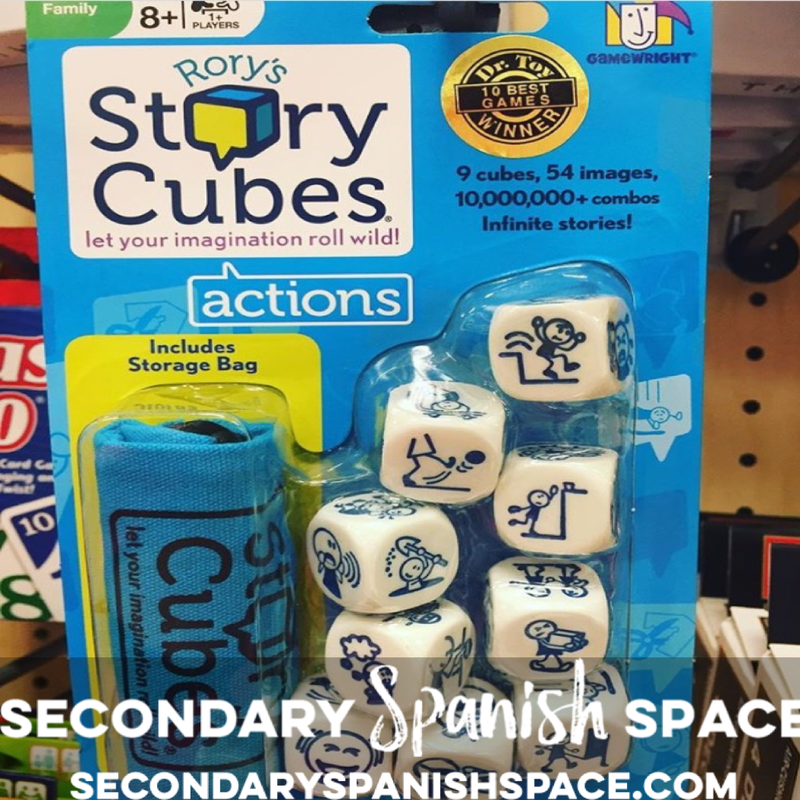 I love the story cubes idea! 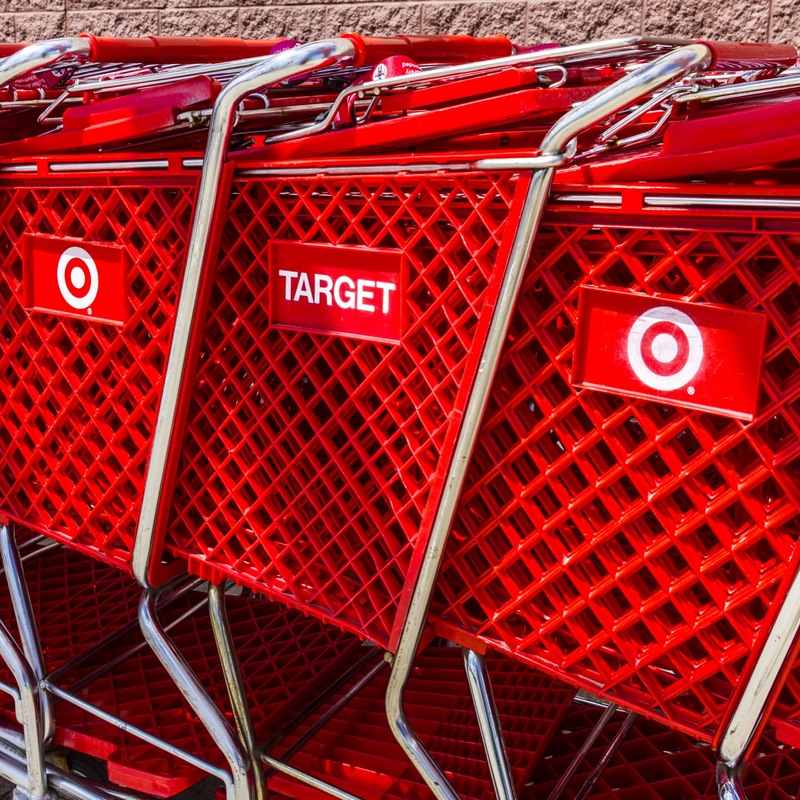 I will definitely look for them the next time I am in Target! I found the time cards in the dollar section last year. They were a fun way to practice telling time. Yes! That is where I found them, too. I was so excited! There are hidden treasures in there every time I go to Target, I swear. Great idea about the story cubes. I actually have the some and now will use them in my class. Quite an amazing things to buy, thanks for sharing it with us. This is quite interesting. Thank you so much or publishing this amazing blog post. 12 dollar Hosting Keep posting.